Roberta Scott of the Warren County Board of Education is the 2017 recipient of the Raleigh Dingman Award for Outstanding Boardsmanship. 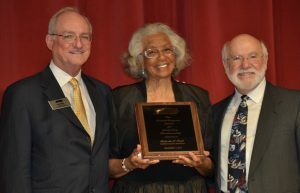 To receive this esteemed award, which is given annually by the North Carolina School Boards Association (NCSBA), a board member must be peer-nominated by their local school board. “This board member has enjoyed a rich career in educational service, including serving as a public school teacher, reading/English teacher for U.S. military personnel, adult high school program coordinator for the community college, and a school board member,” said NCSBA Executive Director Ed Dunlap during the announcement. Scott has devoted more than 50 years to the field of education. She is a dedicated advocate for providing a quality, equitable education to all students and has worked tirelessly for students both locally and across the state as an NCSBA past president. The Raleigh Dingman Award is the highest honor bestowed on a North Carolina school board member. The award is named in honor of Dr. Raleigh Dingman, the Association’s first full-time executive director, and was first presented at the 1981 annual conference. In 2002 legislation was passed by the North Carolina General Assembly that provides for the Raleigh Dingman Award winner to serve as an ex officio advisor to the state board of education and to attend meetings and participate in deliberations of the state board. Scott will serve in this capacity. In recognition of their outstanding service as board of education members, the following board members were selected for the honorary All-State School Board. These individuals have made significant contributions to their school systems during their tenure and were peer-nominated for the Raleigh Dingman Award or the School Board Leadership Award, which was won by Chris Wilson, Camden County. All-State Board Members are: Eltha Booth, Beaufort County; Shearra Miller, Cleveland County; Christian Overton, Camden County; Dr. George Truman, Anson County; Barbara Yates-Lockamy, Columbus County; and Bob Wyatt, Rockingham County.